Stenocarpus sinuatus, the Fire Wheel Tree belongs to the family of the Protaceae. Most are found in New Caledonia and there are about 7 species native to Australia. Stenocarpus sinuatus occurs in nature as a tree to about 30 metres but it is usually smaller in cultivation, about 10 meters tall, particularly in cooler areas. It is one of Australia's most spectacular trees. It makes an excellent container plant for indoor use. 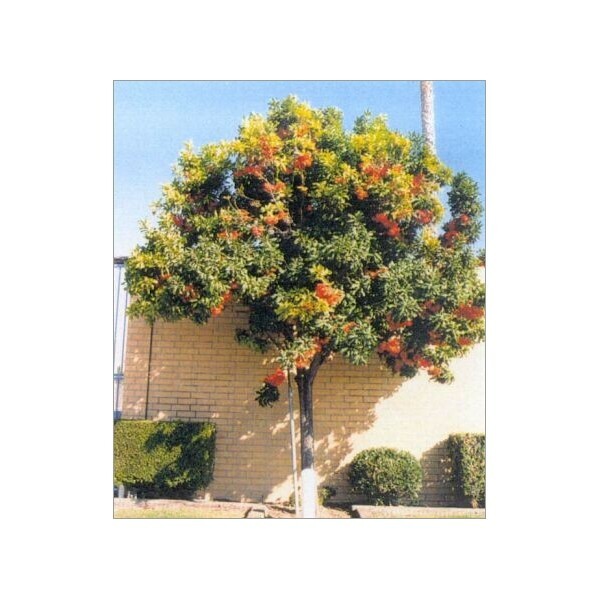 The Firewheel tree takes its name from the configuration and colour of the inflorescences in which the small flowers have a wheel-like arrangement. It blooms intermittently in Summer through to Autumn. The bright red flowers are each up to 4 inches long.The evergreen foliage is quite dense and attractive. Individual leaves are normally green and display a glossy upper surface with the under-surface a pale green. Leaves on young trees may be 10-12" long and deeply lobed. 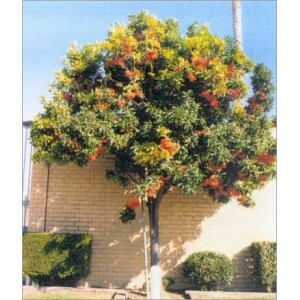 On older trees leaves are smaller and less lobed or not lobed at all. Very little leaf drop. The bark is light brown and smooth. The fruit is a dark grey-brown follicle, 5-10cm long and more than 2cm wide. Hardiness zones 10-11, (1ºC/35ºF, 4ºC/40ºF) in Winter. Despite its sub-tropical to tropical origin, Stenocarpus sinuatus is adaptable to a range of climates and will even succeed in dry climates if additional water is available. It prefers fairly rich, loamy soils but is tolerant of most well drained soils. It may be grown in a sunny or partly shaded location. Stenocarpus responds well to high rainfall, deep soils and high humidity. Given these conditions the species tends to flower well. Germination Smoke Seed Primer is ideal for treating seeds of Stenocarpus. You can purchase this in the Smoke Seed Primer category. You can also soak the seeds in hot water for a couple hours.Many wildflower seeds are dormant and need very specific conditions for germination. The smoke seed primer solution contains a combination of natural substances that overcome dormancy and stimulate seed germination. Sow the seeds at 0.5cm deep in moist growing medium, and provide plenty of light. Relatively high temperatures, 18°C, are required for seed germination. Plants grown from seed may take 7 years or more to flower. Germination normally begins about 1-2 months, it can take longer, don't give up.